To have a better understanding of Pyruvate Kinase Deficiency it can be interesting to know some basic facts about our blood, especially the red blood cells. Blood is a bodily fluid that intervenes in the transportation of oxygen through the body, delivers necessary substances such as nutrients, hormones, waste products en warmth and plays an important role in the protection and defense of the body. Blood is composed of blood plasma and blood cells: the red blood cells (RBC), white blood cells (WBC) and blood platelets. The blood platelets are important for the blood clump, while the white blood cells are important for protection and defense against foreign organisms such as viruses, bacteria etc. The red blood cells, also called erythrocytes, have the major task of transporting the oxygen (O2) from the lungs to the body cells and carbon dioxide (CO2) from those same cells to the lungs. Their particular shape is fully adapted to their major task, the transport of oxygen, because it gives them a bigger surface for gas exchanges. Red blood cells don’t have a nucleus, in contrast to the other body cells. Without this large structure in the cell, they can carry more oxygen. But this also means they cannot reproduce and will eventually die. Red blood cells don’t have mitochondria or other organelles that are present in other cells. Red Blood Cells have a bright red color caused by the presence of the Hemoglobin (Hb). More than 30% of the weight of the red blood cells exists of Hemoglobin. 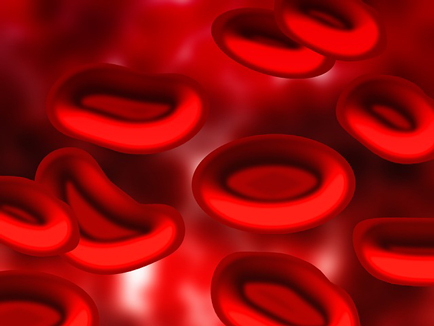 One red blood cell can contain up to 280 million molecules of Hemoglobin. When we inhale, the oxygen from the air goes into the lungs and binds to the hemoglobin in the red blood cells. The blood transports the oxygen to the different organs in the body, where the oxygen is released from the hemoglobin and can be used to burn nutrients to provide energy to the body cells. This process releases carbon dioxide. The carbon dioxide will then bind to the hemoglobin in the red blood cells and will be transported by the blood to the lungs where it will be released and exhaled. Hemoglobin contains several iron atoms that play an important role in the binding mechanism with oxygen. This is important to know, because a lack of iron can cause a lack of hemoglobin and, thus lead to anemia. A lack of iron is one of the major causes of anemia, which explains why people often recommend taking iron supplements when someone has anemia. Although, in the case of an anemia caused by Pyruvate Kinase Deficiency, there is no lack of iron and iron supplements could in fact be harmful if taken without consulting a doctor. Learn more about the different kinds of anemia. Learn more about the how a lack of pyruvate kinase affects the body. To maintain a normal count of red blood cells, the body must produce at least two million new, mature red blood cells per second. The production of red blood cells takes place in the red bone marrow, the tissue in the interior of bones, and lasts about 7 days. Stem cells differentiate into cells that start to produce hemoglobin. When the cells are almost fully developed, they adopt the particular shape of a red blood cell. These developing cells are known as reticulocytes. One or two days after leaving the red bone marrow and circulating in the blood, the reticulocytes become mature red blood cells (erythrocytes). Normally the production of red blood cells can compensate for the number of destroyed red blood cells. When there are more red blood cells being destroyed than being produced, the oxygen concentration in the blood will decrease and the body cells will suffer from a lack of oxygen, called hypoxia. This will stimulate the kidneys to produce erythropoietin (EPO), a hormone that will stimulate the production of red blood cells in the red bone marrow. The number of red blood cells in the blood will increase, thus delivering more oxygen to the body cells. Red blood cells need energy to maintain their vital functions. Because of their lack of a nucleus and mitochondria, they cannot produce energy by using oxygen the way other body cells can, through what is called the oxidative Krebs cycle. Instead, they are totally dependent on anaerobic energy production, another kind of energy production that is carried out without oxygen, also called the Embden-Meyerhof pathway. It consists of the conversion of glucose (sugar) to pyruvate and then lactate, thereby producing energy. There are different enzymes that stimulate this conversion of glucose, one of them is pyruvate kinase. The pyruvate kinase enzyme stimulates the conversion of Phospho-enolpyruvate (PEP) into Pyruvate.